My pops is buying Theresa and I one of those fancy internet phone jacks to install at the house, so that we can talk on the phone and not use our cell phone minutes. The thing is that we are on the go so often that we rarely have time to talk with folks anyways; we mostly just text with our cell phones. Part of the plan in having a phone at the house is to back up a little from our fast paced lives and simply talk with folks. My mom use to do that… and she still does. I remember her calling all kinds of people on Sunday nights. She would sit on the barstool by the bar in our home and just chat away. As a culture we have moved away from that, not many people take that kind of time anymore. As soon as my dad told me about what he was planning on getting us, I began to look for retro phones. He thought that I should get some cordless phones (I had almost forgot those existed!). But, I was adamant that if we were back-tracking we we’re gunna do it right. As soon as I found out that rotary phones wouldn’t work with the newer technology, I began looking online for early 80’s push button phones. 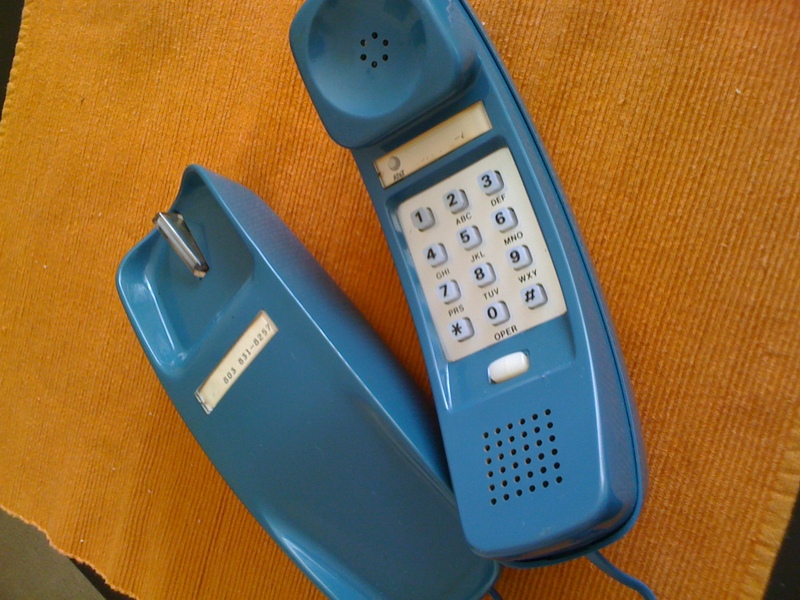 Then I saw it, the first phone I remembered using, a Western-Electric Trimline. I looked online trying to find one at a descent price that might actually function. They were too expensive and none of the ones I saw interested me for the price. Either the color was lame or the price was too high. Today I needed some down time, so I decided to drive to Clover (20 miles away) to an Antique store there to see if they would have one. I drove by faith, believing that I would find at least something that would resemble what I wanted or could use. I went in a couple antique stores, all right next to one another (weird). Then went into the last one, a huge flea market sized place. Two gentlemen, who were country friendly, were seated by the door; I told them that I was looking for an old push button phone. One man told me that he thought that he might have one, he got up, and began to walk into the farthest corner of the huge grid of (pretty cool) junk. A few moments later he found it. It had a $8.00 price tag on it, and it was JUST like the one I had growing up and in great condition. We tried it and it worked perfectly! I paid him $8.56 and left with it. This was a miracle to me… and FOR me. I’m not even sure why it hit me this way, but that phone had such value to my heart. I was unaware. As I drove home from Clover I began remembering calling my dad when I was a boy on a phone like that, missing him dearly as my parents were separated. I remembered answering it as a kid and it seeming like it was always for my older brother. I remembered how heavy, and hot it would get when I stayed on it talking to friends for long hours. I was moved emotionally and very grateful. I felt like God was smiling on me. Yeah, it’s just a phone. And yeah, I could of paid $50 for one online, and it would of had some significance. But somehow I see what happened today as a miracle, not necessarily what happened, but how what happened made me feel. It reminded me that I am specifically loved by God. And that He knows me better than I know myself. Thanks for sharing J! As I read this it made me think about allot of things that used to be different when we were younger . It also made me reflect on things that we don’t think about with all of the hustle and bustle we go through just trying to make it in this modern technology driven world we live in today. More times than not we forget about the things that we should hold in the highest regards . After all the things we take for granted are the most important and are given to us from the Lord who made the greatest sacrifice of all!